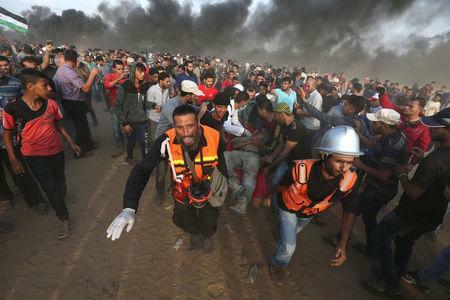 GAZA (Reuters) - Israeli soldiers shot and wounded 130 Palestinians during protests near the Gaza Strip border on Friday, the enclave's Health Ministry said. An Israeli military spokeswoman said about 10,000 demonstrators massed at the border and that some threw burning tires, grenades and explosive devices at the troops across the fence. But the protest was relatively small - some of the previous gatherings included about 30,000 people, a sign that tensions that have built up in the past few days may be easing. On Thursday Israel had ramped up armored forces along the Gaza border, a day after a rocket fired from the enclave destroyed a home in southern Israel. Israeli Prime Minister Benjamin Netanyahu, vowed "very strong action" if attacks continued. A Palestinian official, speaking on condition of anonymity, said Egyptian security officials had held separate meetings in the past few days with Israeli counterparts and with leaders of the Palestinian Islamist Hamas group that rules Gaza in an effort to prevent an escalation in violence. Palestinians have been protesting along the border since March 30, demanding an end to Israel's blockade of the territory and the right to return to lands that Palestinians fled or were driven from upon Israel’s founding in 1948. About 200 Gazans have been killed by Israeli troops since the protests started, according to Palestinian Health Ministry figures, and an Israeli soldier was killed by a Palestinian sniper. Palestinians have also launched incendiary balloons and kites from Gaza into Israel and on occasion breached the Israeli frontier fence. More than 2 million Palestinians are packed into the narrow coastal enclave. Israel pulled troops and settlers from Gaza in 2005 but maintains tight control of its land and sea borders. Egypt also restricts movement in and out of Gaza on its border. Israel and Hamas have fought three wars in the past decade.